The Miller Lite Deck is the ultimate destination for Packers fans who love a good time! Located in the South End Zone of Lambeau Field, the Miller Lite Deck is an exclusive place to have fun while watching a game and enjoying the great taste of Miller Lite! Every Miller Lite Deck guest receives a souvenir laminate credential and a coupon for a complimentary Miller Lite. Outdoor seating within the Deck area is available on a first come, first serve basis to those with credentials. There is a private bar, flat screen TV’s, bathrooms and concessions exclusively for Deck guests. You must present a PHOTO ID and your voucher to receive your ticket. All guests MUST check-in at the Miller Lite Deck Will Call Window located at the Shopko Gate on the South side of Lambeau Field. Check in begins 2 hours prior to game time and ends PROMPLTY 30 minutes prior to kick-off. Failure to check-in during designated time will result in ticket forfeiture. ALL GUESTS OF THE MILLER LITE DECK MUST BE 21 OR OLDER. Valid Photo ID is required when you check-in. Anyone found to be under age will be removed from the section and their credential will be confiscated. Your credential is only good for entrance into the Miller Lite Deck. Your credential will not allow you to sit anywhere else in the stadium. The credential must be visible around your neck at all times within the stadium. All credentials are non-transferable. There is no assigned seating in the Miller Lite Deck and there may not be enough chairs for everyone. Seating is on a first come, first serve basis. If you leave your seat you are not guaranteed it will be available upon your return. There is plenty of space to stand in the section and enjoy the game. All of the seats in the Miller Lite Deck are outdoors. Please plan accordingly for the weather. Please call the Packers in advance of game day to arrange for handicap seating. Please be considerate of your fellow Miller Lite Deck guests and those fans surrounding the section. Any guest exhibiting disorderly behavior will be removed from the section. No smoking is allowed in the Miller Lite Deck. Police officers are stationed at each entrance gate to ensure your safety while visiting Lambeau Field. You and your belongings may be searched upon entry into the stadium. If you elect not to consent to being searched, you will be denied entry. Please be aware that carry-in policies may be modified from game to game as security levels change, and items permitted into the stadium may be determined at the discretion of each officer. Firearms and other weapons, bags, backpacks, coolers, umbrellas, duffel bags, large purses, fanny packs, obstructive banners and signs are all strictly prohibited, as are food & beverages, noisemakers of any kind, video cameras and still photo cameras with lenses over 12 inches. As a general rule, please leave all unnecessary items at home. Fans with seats in the new South End (i.e. section numbers ending with the letter “s”) must enter through the new Shopko Gate on the south side of the stadium, which is for the exclusive use of South End ticket holders. Fans sitting elsewhere in the stadium are encouraged to use the gate suggested on their ticket for the most direct route to their seats. Lambeau Field is now a smoke-free facility as required by Wisconsin State Law. This includes the Lambeau Field Atrium, 1919 Kitchen & Tap, stadium bowl and concourses. There are no designated smoking areas inside Lambeau Field, nor is exit and re-entry permitted for smoking. This policy also applies to smokeless and electronic cigarettes - they are not permitted. Guests who fail to comply with this policy may be ejected or subject to a fine. Thank you for your attention to this new policy. 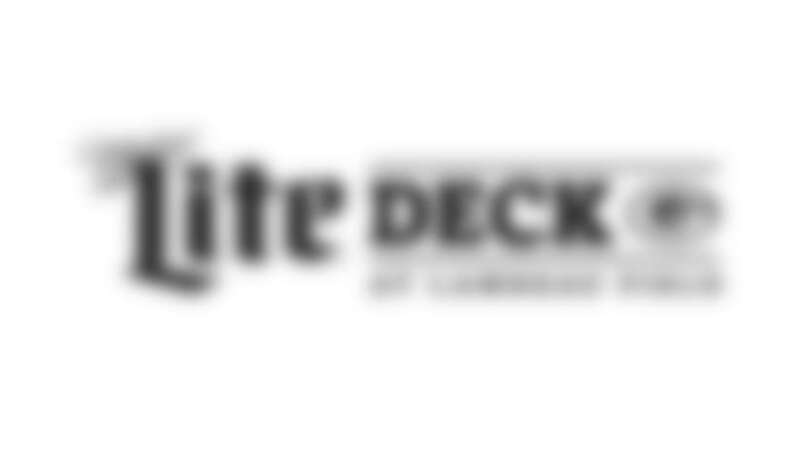 WHAT IS THE MILLER LITE DECK? The Miller Lite Deck is a collaborative effort between the Green Bay Packers and MillerCoors. The Miller Lite Deck is located in the South End Zone of historic Lambeau Field and was created during the 2013 Lambeau Field South End Zone Expansion Project. HOW DO I GET TICKETS FOR THE MILLER LITE DECK? Tickets to the Miller Lite Deck will be prized at Miller Lite Deck Bar Promotions throughout the state for the duration of the season. WHAT DOES MY MILLER LITE DECK EXPERIENCE INCLUDE? There is a private bar, flat screen TV’s, bathrooms and concessions exclusively for Deck guests. Two (2) Miller Lite fans of the game will be chosen and will have a chance to be on the Tundra Vision Live from the Deck. WHAT'S SO COOL ABOUT THE MILLER LITE DECK? The Miller Lite Deck is THE place to be to watch the Packers. The Miller Lite Deck features open seating, little or no lines, and the best view in all of Lambeau Field. HOW BIG IS THE MILLER LITE DECK? The Miller Lite Deck holds up to 260 Packers fans. HOW OLD DO I HAVE TO BE TO ENTER THE MILLER LITE DECK? The Green Bay Packers and MillerCoors remind all fans to drink responsibly. All guests entering the Miller Lite Deck must be at least 21 years of age.